NarutoITP is a Free Form Role Playing (FFRP) universe that was developed, and is currently populated by, members of the Giant in the Playground forums. The setting and style of the game are based primarily on the Naruto universe, a serial manga and adapted anime by Masashi Kishimoto and published by Shounen Jump. NarutoITP originated as a spiritual twin to the BleachitP game in that both of them are alternate universes of each one's canon where people can play their own characters and create their own stories. A simple idea that evolved into full-on games and communities. Currently, all of the shinobi described in the Naruto manga have been replaced with player-imagined characters, though some similar spots have been filled in by player created characters. There's a Sandaime Hokage so far, the Shoku (the organization that replaces Akatsuki in NarutoITP), numerous chuunin and genin, a couple missing-nin, and even a few jounin. But there is always room for more people with creative ideas and characters, especially for the other Hidden Villages besides Konohagakure. This Wiki is a tool created to assist players of NarutoITP in keeping a record of characters, groups, and outstanding events within the fan-made storyline. 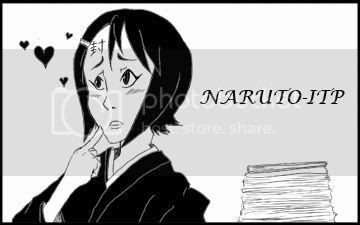 All members of the NarutoITP FFRP are permitted, and encouraged to create or edit whatever pages they wish in order to better represent and organize the information about NarutoITP. What is [Naruto Term]? Can I find it here? The primary resource used so far by the players of NarutoITP when referring to the original Naruto series is the Naruto Wiki, linked to here. If you have any other questions regarding the fan-made setting or events that have already transpired, feel more than free to ask at the current NarutoITP OOC thread, or PM any of the active members. NarutoITP is an open ended game that anyone can join and are encouraged to! If you are interested in joining the game, please let us know in the current OOC thread, where we can help you collect your ideas, define your character, find a position within Konohagakure (or other groups), and even assist you with Japanese translations that you may require. Once you have defined your character concept, post it to this thread, using either the format used in the other profiles in the thread or using your own. After that, you are free to post in whichever IC thread is appropriate for your character and join the fun! Anyone is free to contribute to this Wiki, and are encouraged to do so. Only two things are required to give you access to adding and editing pages: First, as this is not an Open Wiki, you will need an account in Wikidot. The only thing required for such an account is an active E-mail address, and is completely free. Second, your Wikidot account must be linked with the NarutoITP sub-wiki. This only requires you to enter the Password in the Naruto OOC thread; this is just to make sure you're part of our group. Once you've set everything up, which should only take a few minutes, contribute away! This should eventually contain a synopsis of the history, current attitude, and other little details about the Hidden Villages that appear in the NarutoITP story. These are all in need of Details; suggested sources are the Character Profiles in the Character Registry thread, and should also include a list of important events, battles fought, opponents, and whether each fight was a win or a loss. If a character has had an OoTS-Style avatar created of them or an actual picture, these should be edited in to their Character Page. While this site is independent, I request that all editors abide by the Giant in the Playground rules while adding content here. Thank you.